The Dead Seal Database was started when it became clear that no one was officially keeping a record of reports of dead seals around our coastline. The Irish Seal sanctuary started to keep a database of any dead seals reported to us. This entailed getting word out to the general public that we wanted to know about any dead seals sighted, if there were any visible injuries: location and species. A photo was requested if possible to confirm species and also to discount possible double recording of same animal. In all case we erred on the side of caution. The database was started in April 2012 and this report covers the results up until Mid-April 2014. 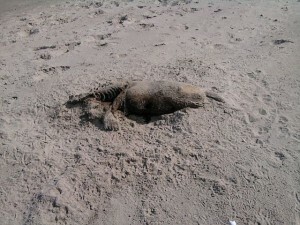 Records of dead seals reported to us for the period January to April 2012 are included. We requested members of the public to report if they come across any dead seals while walking our shoreline. Requests were put out on social media and when possible on radio and print media, by ourselves and fellow Environmental organisations.